To keep in memory there is always a rose on the floorTo coincide with the 60th anniversary of the liberation of the Buchenwald concentration camp on 11th April , the first impression of the book entiteld 'Tears are not enough' by Zacharias Zweig (posthumously) and Stefan Jerzy Zweig was privately printed in spring 2005. 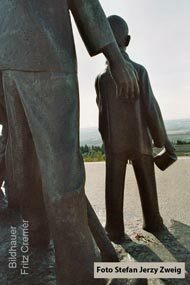 Stefan Jerzy Zweig was the joungest prisoner to pass through the gates of Buchenwald and the last, together with his father, to leave after Liberation. The particular circumstances which led to the liberation of the Buchenwald concentration camp and its prisoners made Buchenwald, more than nearly any other camp, the focal for the numerous post-war analyses initiated by Eugen Kogon which still continue today. Above all, the rescue of nearly 1000 Jewish children and youths from extermination thanks to the extraordinary self-sacrifices made by the political prisoner in Buchenwald has been recorded indelibly in the annals of history. The young people who although saved were orphaned remained together in groups in Switzerland or France even following the liberation, before dispersing over all the continents in order to beginn new lives. This example of one person´s destiny distinguishes itself from countless other examples: Stefan J. Zweig became known through his personal story as the Buchenwald child. For the first time in 60 years, the „Child from Buchenwald“ speaks out on his own behalf – through his father’s, Dr. Zacharias Zweig’s documentation (with which the book begins), and in the form of his own writings, of photographs, drawings, diagrams, collage and photomontage. The book is about 468 pages in length, and the first edition will run to a 1000 copies and will be printed in Vienna. Distribution and general sales of the book 'Tears are not enough' will commence after Stefan Jerzy Zweig´s 65th birthday on Jannuary 2006. Sea of Life so called Dead Sea.